Study area – click to enlarge or download. 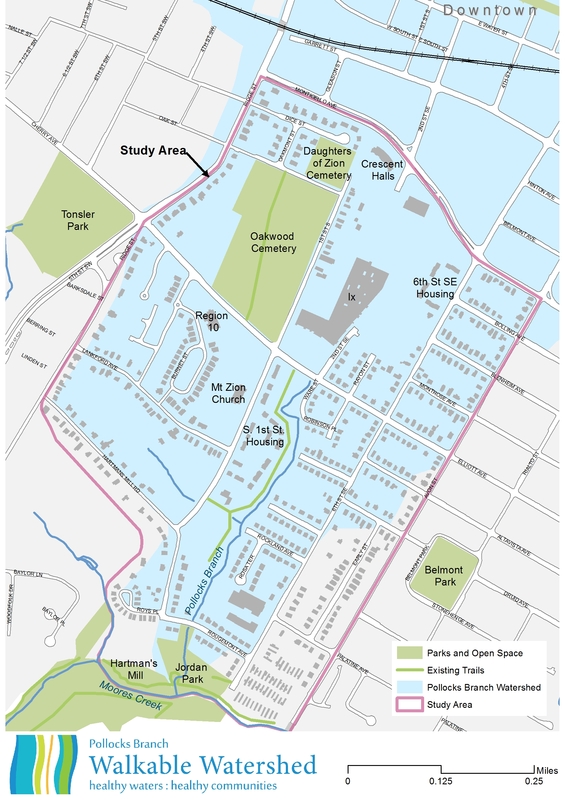 The City of Charlottesville is partnering with the James River Association, Skeo Solutions, the Center for Watershed Protection, and The Bridge PAI on a Walkable Watershed process for the lower portion of the Pollocks Branch watershed (see map to right or click here to download). This project brings together several focus areas that the City has identified as high priorities and aims to tackle them simultaneously! This effort builds on previous planning efforts, including the Pollocks Branch vision and design goals identified in the Strategic Investment Area Plan. Engaging and educating residents to celebrate Pollocks Branch and promote watershed stewardship. 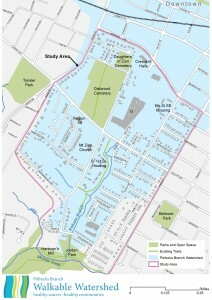 Please click here to download the concept plan which includes opportunities to improve walkability and water quality. 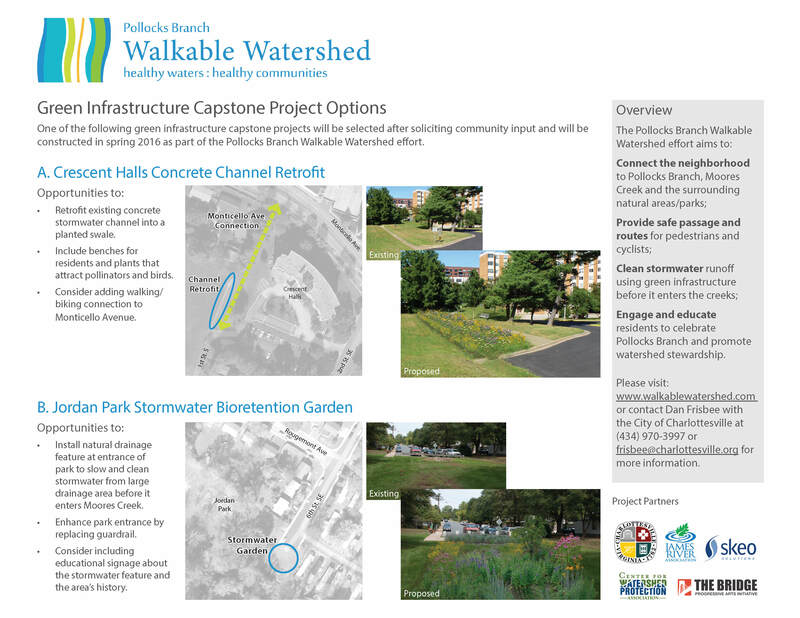 This effort will result in one green infrastructure project built on public property – please see below for more information about the Green Infrastructure Capstone project. Most recent updates are listed first. Please check back often for updates. Join the Charlottesville Area Tree Stewards to learn how to select, plant, and care for trees in your own yard. Each workshop participant will receive a FREE TREE thanks to the James River Association. Workshop leaders will work with you at the workshop to select the right tree species for your yard. Trees will be delivered in October. Download the flyer here! Registration required: please click here to register! As part of the Pollocks Branch Walkable Watershed project, the City is partnering with several other local organizations to hold a Community Festival on June 25 from 2-5pm at the ball field at CRHA’s South First Street property. 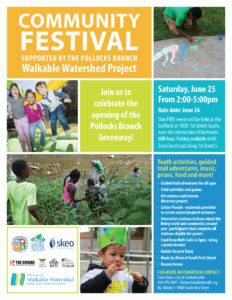 The event aims to celebrate the work that has been done as part of the Walkable Watershed process, most notably the opening of the Pollocks Branch Greenway trail behind South First Street, while connecting neighborhood residents to each other and the natural world around them. The free, family-friendly event will include guided trail adventures, field games and activities, art creation, interactive stations from community groups, a bounce house, music, food, and more! Download the flyer here! Project partner, The Bridge Progressive Arts Initiative worked with community members to paint a permanent mural designed by local youth and professional artist to celebrate local waterways. This project was sponsored in part by this NFWF grant. A survey of the project area revealed that the concrete drain at Crescent Halls is in very close proximity to the Daughters of Zion Cemetery. To avoid any potential disturbance to the cemetery, the project team is evaluating alternate locations within the watershed to install a green infrastructure capstone project. More information will be available soon. James River Association, in partnership with C’ville Foodscapes and Urban Agriculture Collective of Charlottesville (UACC) will be hosting a workshop on how and why to compost. Workshop will be held in the Ix Building at 963 Second St SE from 6-7pm. See flyer for more information! The project on public property to clean and treat stormwater runoff has been selected, based in part on the input received from residents. The project is located at the end of 1st Street South, adjacent to the Daughters of Zion Cemetery and Crescent Halls and will include replacing an existing concrete stormwater drainage ditch with a vegetated bioretention swale (see Option A on page 4 of the draft concept plan). The project will provide an outdoor gathering space for residents, habitat for birds and pollinators, and potentially include a pedestrian pathway to connect 1st Street South to Monticello Avenue. Design work is just getting underway, and will include further opportunities for resident engagement and input. Construction is planned for 2016. 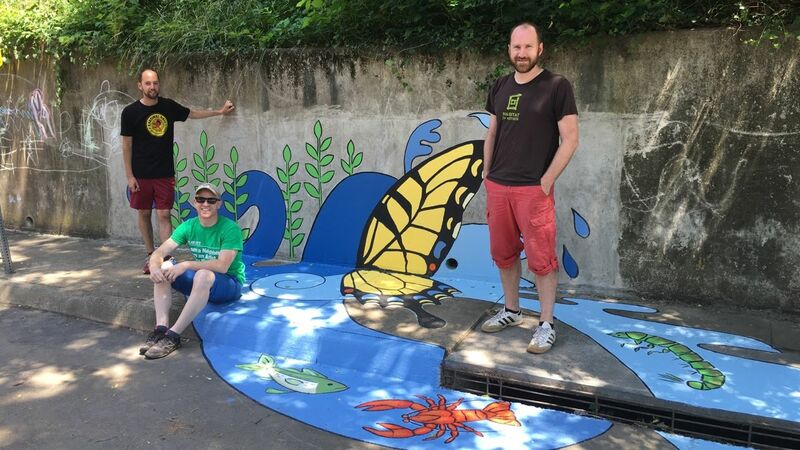 Project partner, The Bridge Progressive Arts Initiative worked with community members to paint a temporary version of a mural designed by local youth and professional artist to celebrate local waterways. 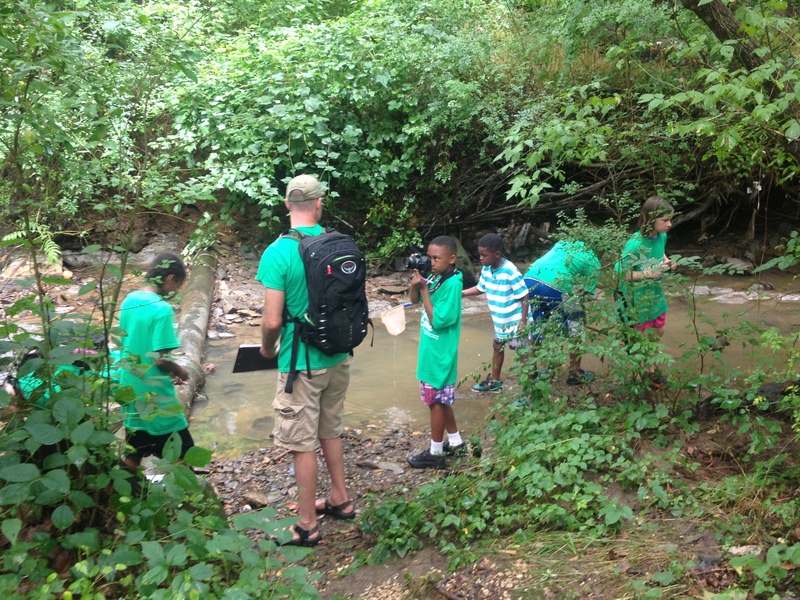 This project was sponsored in part by this NFWF grant. Click here to see news article. A permanent installation of the mural is planned for spring 2016. A brief presentation about the project was shared at the Ridge Street Neighborhood Association Annual Meeting. The draft concept plan and two options for the green infrastructure capstone project were shared for feedback. A brief presentation about the project was shared at the PHAR Resident Services Committee meeting held at Crescent Halls. The draft concept plan and two options for the green infrastructure capstone project were shared for feedback. A brief presentation about the project was shared at the PHAR Resident Services Committee meeting held at West Haven. As part of this grant-funded project, James River Association will be installing 100 rain barrels in the Ridge Street Community. Please contact Amber Ellis to schedule a time for volunteers to install your rain barrel! Click here to email her or call her at: (804) 788.8811 ext.205. 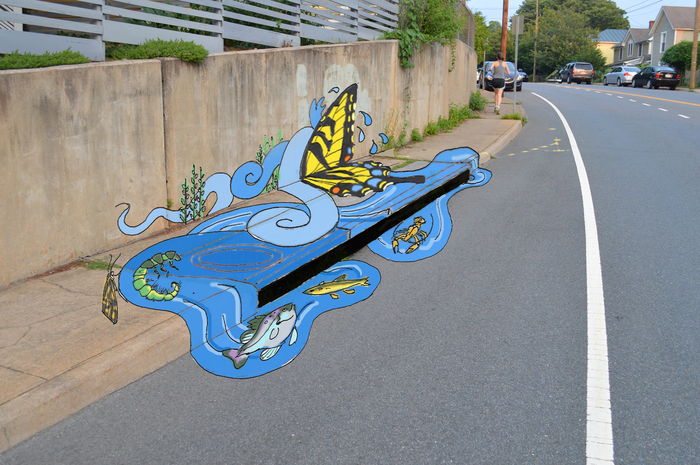 Project partner, The Bridge Progressive Arts Initiative is leading Water Wise, a project based education program that allows underserved youth to research the importance of our local watersheds and respond through the creation of street murals. Read more here! A brief presentation about the project was shared at the Ridge, Willoughby, Burnet Commons Neighborhoods “Our Town Charlottesville” meeting. Meeting audio and notes will be posted here. Monday, June 8, 2015 – Community Input Session! A community input session was held on June 8 from 6-8pm at Portico Church at 981 2nd Street SE to review a draft concept plan and provide input on a list of potential projects to improve walkability, connectivity, and water quality in our local streams. Download meeting flyer here! The meeting presentation (which includes the draft concept plan and list of potential green infrastructure capstone projects that could be implemented as part of the grant) is available to download here. 434-975-6700 ext. 235 or email. (804) 788-8811, ext 205 or email.